District would like to offer name badges (or pins) for all paid members who achieve an educational award (e.g. CC, ACB, ACS, ACG, CL, ALB, ALS, DTM, IP1, DL2, MS3, TC4, PM5 etc...) this term (7/1/2018-6/30/2019). 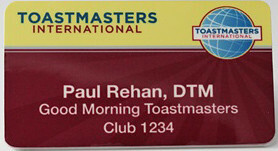 General members’ badges are blue (upper part) & white (lower part), DTM badges are yellow (upper part) & red (lower part). Please see attached two pictures. Awards must be submitted in Club Central. There is a limit of one badge (or pin**) per member during the 7/1/2018-6/30/2019 period. If members would like to apply, please ask your club to fill in the attached application form and e-mail to Logistics Manager, Yvonne Lai (lystea@hotmail.com). District will purchase name badges (& pins) approximately every two months. The 1st order deadline will be 15 Feb, 2019. Following order deadlines will be 31 March, 31 May and 30 June, 2019. 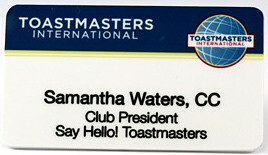 Note: for Pathways Level completion, the badge will show e.g 'Samantha Walters, PM3' for level 3 completion. If Level 5 of a path is completed, the badge will show e.g. 'Samantha Walters, PM5'.